Tickle My Senses: Barbequed King Prawns in a Coriander, Chilli and Lime Marinade. Barbequed King Prawns in a Coriander, Chilli and Lime Marinade. Do dust off those barbies, light up those coals and let them glow!! 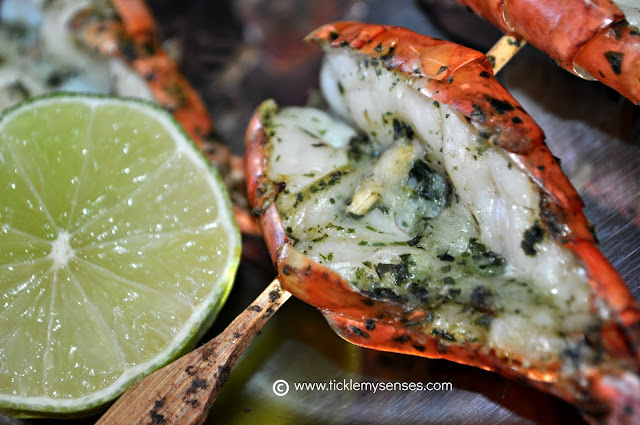 Enjoy these juicy and delicious barbequed (can be even oven grilled) king prawns marinaded in a simple sauce thats bursting with fresh flavours of freshly ground coriander leaves, green chillies and garlic brought together by olive oil and zingy lime/ lemons. 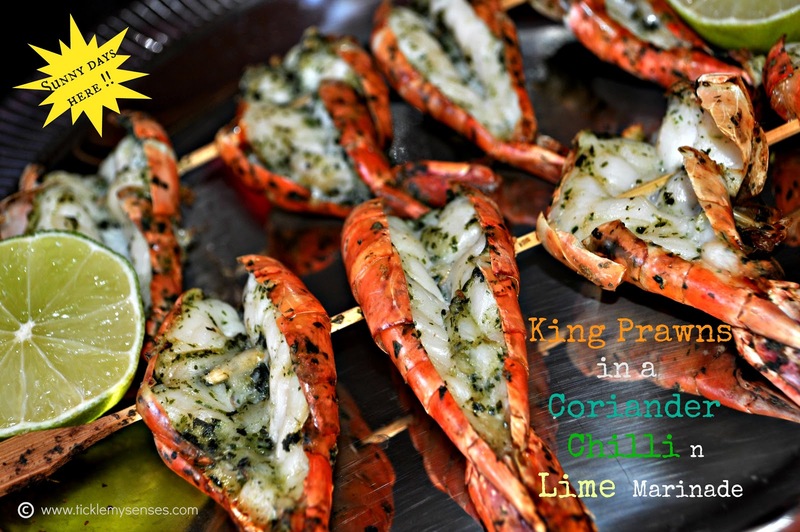 For Barbequed or Grilled King Prawns in a Coriander, Chilli and Lime Marinade. Cloves of garlic: 2 nos. 1. Soak the wooden skewers in cold water for 10 minutes, so they don’t burn when you put them on the BBQ later. 2. Finely chop the fresh coriander leaves, green chillies and garlic then place in a mortar along juice of 1 lime or lemon, 1/4 tsp of sea salt and crush with a pestle to get a smooth paste. Then add around 50 ml of olive oil to the ground paste. Mix well. Add pepper to taste. Adjust salt, adjust sourness by adding more lime juice if needed. Keep aside. 3. Prepare the prawns by Butterfly them and deveining them. Place the prepared prawns in above marinade. Leave to marinate for 1 hour. To learn how to butterfly prawn watch this video. 4. After an hour thread 5 prawns on to each skewer. Place the skewers on the hot bbq for a 2-3 minutes on each side. Serve hot. 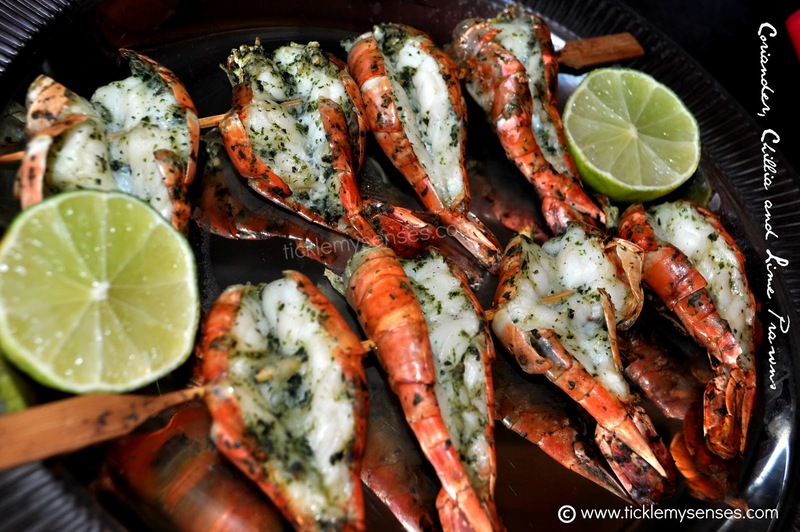 If grilling in an oven place the prawns on the top shelf of an oven at 250C and allow the prawns to grill for 3- 5 minutes till the shells start to turn pink and the flesh white. Enjoy the bright and warm weather friends. I am off to spend the weekend with lovely friends. I look forward to all your lovely comments, feedback and foodie pictures!! What a awesome site...fun, great recipes and a real heart energy!